For call-in customers ImageTech will be supplementing Canon’s already spectacular July Sale on the Canon ProSeries printers. 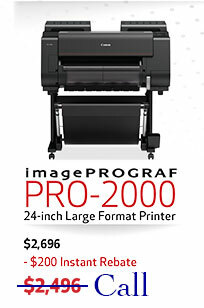 These printers are already at very low prices and ImageTech has even lower prices that we can’t advertise here. These deals are limited to availability and, regardless, end on July 30 –so act quickly to the full benefit! 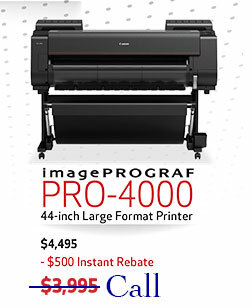 The 44″ Canon ProSeries Pro4000, after a $500 Instant Rebate, has an advertised price of $3,995. Call us and we’ll drop it further! Canon ships this printer with a free set of inks valued at $1,161. We’ll throw in the Spyder4Elite monitor calibrator valued at $260, plus give you the choice of, either, A) a second-year of product warranty valued at $800 or B) a Canon media bundle* valued at $500. 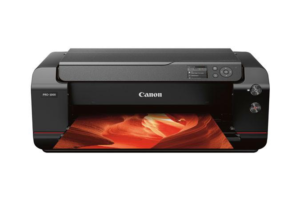 Canon’s instant rebate has dropped this 24″ printer an additional $200 to $2,496. Again, call in and we’ll mark it down even further The printer also comes with a Datacolor Spyder4Elite monitor calibrator valued at $260. On top of this, customers have a choice of, either, A) a second-year of product warranty valued at $650 or B) a Canon media bundle* valued at $250. This 17″ printer is priced at only $1299.99 –an excellent option for those looking for a versatile fine art printing option. Arguably one of the best printers Canon has ever engineered, this printer creates stunning blacks and whites and a wide color gamut that accurately reproduces even the most difficult colors. * The Canon media promo is based on MSRP. Canon media must be ordered on the same purchase order as Pro-Series promo unit. Media roll width may not exceed the print width of the Canon Pro-Series promo unit. 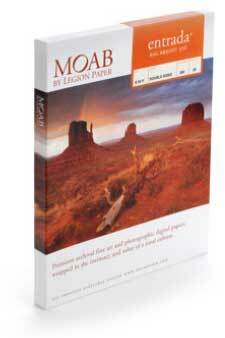 ImageTech now carries the full line of Moab fine art digital papers by Legion Paper. 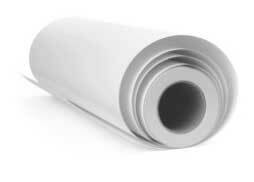 ImageTech seeks to offer the best prices and service on Moab papers for desktop or large format printing. Shop directly online at Bayinkjet.com. Call us or drop by our showroom for more information on our wide selection of fine art and commercial papers and wide-format printers. These desktop and large-format digital fine art papers will meet your most demanding needs. Moab provides the value of a major brand wrapped in the intimacy of a rural culture. With product names like Entrada, Colorado, and Lasal its easy to see the source of inspiration for Legion Paper’s Moab brand. Created in Moab, UT surrounded by the endless red rock wonders of Arches and Canyonlands National Parks, the Colorado River, and the LaSal Mountains, the Moab line of archival, digital imaging papers continues to rely on that inspiration to design premium solutions for digital photographers and artists.